Every so often a shining example of recognizing an opportunity to reach out and work with an Aboriginal community for the betterment of all comes along that really tugs our heartstrings. 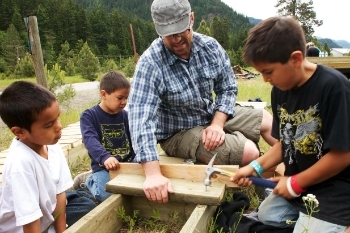 This is the story of how a bunch of kids scrabbled together some tools and lumber and built their own mountain bike park all on their own, and in doing so launched the impetus for a visiting community planning consultant, Patrick Lucas, to create the Aboriginal Youth Mountain Biking Program (AYMBP). The Aboriginal Youth Mountain Bike Program is a non-profit, volunteer driven program to assist and support Aboriginal youth and communities to participate and excel in the sport of mountain biking and this is how it all began. When working closely with an Aboriginal community there are many factors and layers of complexities to be considered, some of which are very apparent and distinct, while others are not. The First Nation Health Authority (FNHA) in BC has taken over control of all Health Canada health programs and services for the 203 First Nations in the province. The First Nations Health Authority will be responsible for planning, management, service delivery, and funding of health programs previously provided by Health Canada's First Nations Inuit Health Branch B.C. Region. A first in Canada, the Agreement sees the federal government hand over the annual budget of $377.8 million, while the BC government will contribute $83.5 million over nine years. Fixing the way in which healthcare is delivered to Aboriginal People is a massive, complex undertaking on the national scale. However, on the smaller scale, simple things can be done at the first point of contact, and throughout the care organization that will make a world of difference to not only the Aboriginal patient but also to the health care practitioners. The first step in fixing the system is to create a culturally competent environment for Aboriginal patients. What is a culturally competent health care environment? It is an environment in which Aboriginal people feel culturally safe.............they are treated with respect, compassion, and cultural understanding. A culturally incompetent health care environment is one in which Aboriginal people encounter racism, stereotyping, and disrespect both personally and culturally. This very compelling video Stay With Us Young Warriors, We Need You Here by Vincent Schilling, a Mohawk journalist and author, is a resource we can all share with our children and young adults we know and careabout. This video is particularly great because Vincent makes the point that he has personal experience with some of the darkness that can overwhelm a young life and assures them that it is a point in time that passes and that life will get better. Please consider sharing this video with everyone you know.